Walls are an integral part of a house. These days, people like to use fancy paints on their wall to make them appeal alluring to the eyes. But if you have kids in your house, wall holes, unrhythmic paint strokes, pen marks, colour marks, etc. are quite unavoidable. Plus, there is a most common issue with the walls which is their untimely drying up and giving up on the paint. The process of mending a drying wall is pretty simple but if you seek professional help then they will charge you a good amount of money. 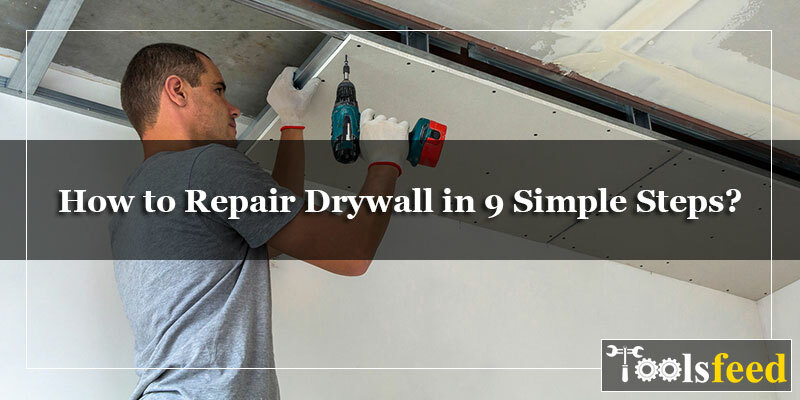 But if you are a DIYer and like to save money like thousand other people reading this article then we can help you with self-fixing the drywall. You can sort the imperfections in such a way that it will be hard to tell if they actually ever existed there. First you will require a “project panel” which is usually available at as less price as $5. These are available at home improvement centres and they usually measure 24 x 24 inches. You can either measure the holes to ensure the right dimensions of the sheet required. This can go up to an expense of $12. Then you need is a saw to cut the sheets. Any kind of joint compound to bind the things. For the same purpose, you can also get spackle. If there are less holes to be covered then you should use the spackle but in case of huge holes joint compound is used. While both the things can be used in the same respect here but they do have their fair share of contrast, especially in case of money. Next you need is a can of paint that resembles the wall colour. If you don’t find the same paint then it will be best to replace the shade of entire wall. Funny thing about the paints is that even the same shade that you used earlier might not look identical in the next purchase because the manufacturers usually change the compound base of the paints which give slight variation in the colour. A carpet knife, putty knife, timber frame square, a screw gun, some drywall screws, and a sanding block with 100 grit paper attached. This is the time when we should start with the process, shall we? First, take out the timber frame and use it to measure the area of the hole. This will give you the target length and width of the area. It will be better if you can add some surplus area to be targeted. This way, you will be able to cover more area. Basically, the whole work has to be done on the wall. And since this is a one-man operation, you cannot hold the timber frame with one hand and fix the drywall with the other. So, its time to use the carpet knife and make a mark on the wall as per the configuration given by the timber frame. You may have to make multiple attempts to give clear imprint on the wall. Don’t apply a lot of pressure on the knife because this way you can damage the wall further. All you have to do is to make 2-3 passes with the knife and the impression will appear on the wall. This may kill the blade instantly but at this moment, your task is to give a clean nice edge. You can replace the blade or better, you can hone it for next-time usage. Now, follow the patch on the hole and trace it to create a clear impression. This is the area that require all the work and you have to fix it. If you try to cut a hole then simply cut a patch to create a hole and there will be huge gaps that will leave tiny cracks. Now its time to cut the polystyrene 1x2 to divide in 2 sections which should be 2-3” longer than the hole. You have to position then inside the wall and then stitch it with the drywall screws by firmly holding it inside the wall. This is the place where you will further attach the patch. This step is quite important in the entire process. Why we chose polystyrene over wood? First reason is that wood breaks as you drive a screw into it. Thus, it does not make for a highly secure connection. Another factor is the wood swells with moisture which eventually leads its shifting around. At the same time, polystyrene does not have any such trouble. It is surely a better choice to make. Now, be very fast and use a sandpaper on a sanding block to knock off the edges around the patch and the hole. This will help in getting rid of the visible seam. Now, its time to position the patch in the hole and fix it using the drive screws. there are few things that you must keep in notice while doing the process. First of all, ensure that all the screws are slightly countersunk below the surface. It shouldn’t be too much, just some 1/8” will be fine. The next step is to press the joint compound into the holes and hide the screws. Next is to make sure that there is an even gap around the patch edges. In the contrary condition, you won’t be able to force any joint compound in the gap which will eventually leave the noticeable seam. Start with loading the joint compound on the putty knife and smash it on the gaps. You should make sure to fill all the gaps and holes and even the screws inside. By pushing it in, make sure to smoothen it up. Make a smooth surface. There is no fixed technique to it but just simple pushing and do. Make sure of using medium pressure and speed for the task. Keep repeating the process until to you satisfied with the level of the wall. Let the joint compound sit on the hole and get completely dry. It will take some 3 hours for the entire process to be done. The plain paint will dry sooner whereas the screws might take some time. Now, take the sandpaper and sponge it slowly over the patch in circular motions. Don’t stay at one place for too long as it will create a dip. This step will cause a lot of dust in the house. If you have breathing condition then we highly recommend using a face mask or respirator to protect from inhaling the bad air. Also, in order to protect the eyes, always wear goggles. You don’t have to put on both these accessories while the entire process but just this small slot. But, this process will leave you with a lot of mess to clean up once you are done. This is the fun part. There are some things that you should keep in mind as you start with the painting process. First of all, you must eliminate carpet, upholstery, and furniture items from the room, or at least keep them at a distance. Now, if you have newspaper, better it to spread on the floor to protect any further hassle of floor cleaning. Trust us, paint marks are very difficult to remove, plus they leave impressions. Best is if you can use plastic sheet to cover the floor. First of all, the freshly sanded joint compound will soak the moisture just like a sponge. You will be able to determine that from the colour of the paint when you began painting and the finished product. You can start by filling the paint brush in the paint can and take out a generous quantity. Let the excess paint flow inside the can so that you don’t end up dripping the liquid everywhere around you. Now, brush it like feathering strokes. Allow the paint to sit on the surface for some time and let it dry down completely. Once the paint is fully dried, you should come back with a roller. There is a great chance that when you got the entire house painted, roller was used to paint the walls. This can be in a particular texture and if you paint the patch with a wrong roller, it will only corrupt the entire wall. So, what can be done? Well, there are two ways of fixing this. One is either you get the same roller that was used earlier on the wall. Or, you can paint the entire wall to give it a matching look.